Reducing the width of lanes provides space for wider shoulders, bicycle lanes, left-turn lanes, etc. Shoulder widening treatment (Shauna Hallmark et al./Institute for Transportation). Visually narrowing lanes is accomplished by re-painting shoulder and median markings to widen the shoulder or median and decrease lane width. Reducing the width of lanes provides space for wider shoulders, bicycle lanes, left-turn lanes, etc. Another option, to give the appearance of lane narrowing, is to provide shoulder surfaces that are different from the roadway surface. Use of colored shoulders contrasts travel lanes with shoulders and can narrow the roadway visually. Shoulder widening to narrow lanes is implemented along the length of the area selected for traffic calming. A transition should be provided in advance. Kamyab et al. 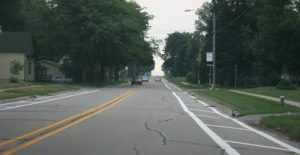 (2002) reported on the use of lane narrowing as a traffic-calming measure in Twin Lakes, Minnesota. Hallmark et al. (2007) used lane narrowing as a rural traffic-calming measure in two rural Iowa communities. In one community, a center median was created using pavement markings. Shoulder markings were also applied using pavement markings. Both treatments narrowed the lanes, however, there was minimal impact on speeds. No crash modification factors (CMFs) were found relating to lane narrowing. Narrowing lanes visually by re-painting lane edgelines is an acceptable strategy, particularly given it does not impede large vehicles or farm equipment. Hallmark, Shauna, Eric Peterson, Eric Fitzsimmons, Neal Hawkins, Jon Resler, and Tom Welch. Evaluation of Gateway and Low-Cost Traffic-Calming Treatments for Major Routes in Small Rural Communities. Center for Transportation Research and Education, Iowa State University, 2007. Kamyab, Ali, Steve Andrle, and Dennis Kroeger. Methods to Reduce Traffic Speeds at High Pedestrian Areas. Center for Transportation Research and Education, Iowa State University, 2002.